McMonagle Stone, one of Ireland’s largest suppliers of decorative stone, recently enhanced its fleet by taking delivery of two new DAF CF460 tractor units from TBF Thompson’s outlet in Garvagh, Co. Derry. The new trucks are part of an ongoing stock investment by the family-run concern, which operates out of Donegal and Dublin. Decked in the company colours, the DAFs were immediately put to work and have impressed their new owners with their fuel-efficiency, power, comfort and style. The task of transporting high quality, natural stone products all over Ireland is not an easy one, but these trucks are clearly up to the task. The Euro 6CFs provide maximum performance at minimal operating costs. Their MX13 engines are packed full of innovative technologies to enhance responsiveness and reliability. A lightweight, steel chassis ensures stability, giving drivers excellent handling on any journey. “We endeavour to keep our vehicles fresh and these new tractor units represent a significant investment in our fleet,” McMonagle Stone operations manager Daniel McMonagle says. An improvement in fuel economy has been noted since the new automatic trucks arrived. The McMonagle fleet also consists of a pair of DAF CF430s, two Iveco Stralis and one Hino. They are complimented by eight trailers comprising two Dennison drop-side tippers, two Montracon drop-side flats, two SDC 40ft flats, one SDC skelly and a new Farlow 40ft dropside flat with mounted brackets. 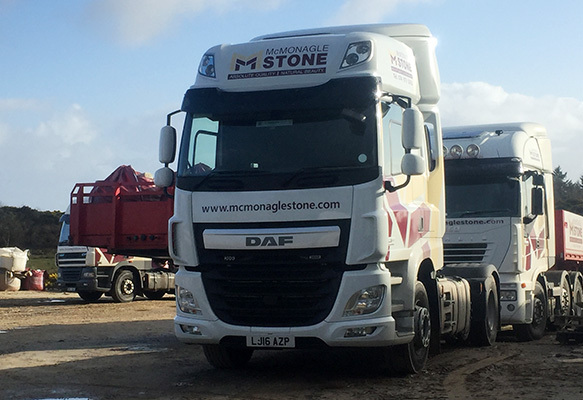 McMonagle Stone employs eight professional, courteous and highly-skilled drivers, including the aforementioned John Griffin and Gerry Byrne who have been with the company for 30 and 15 years respectively. “They got the new trucks because they have been with us the longest,” smiles Daniel. McMonagle Stone was founded as a limited company in 1988 (it had been trading as a sole trader for well over a decade before then) by Daniel’s father, Dan, to supply decorative stone. The Mountcharles, Co. Donegal-headquartered company, which also has an office at Cloghran beside Dublin Airport, has become known as a leading supplier of natural stone and bespoke products to the Irish and international markets. The family-run business operates five quarries in Donegal, two sandstone, two quartzite and one granite. At each production site, stone is carefully prepared to the highest standards depending on destination, demand and production capacity. Eighty-five staff are employed in total. The Mountcharles production facility has the ability to carry out masonry works up to the most complex of designs. McMonagle Stone offers a complete design and supply package. Whether it is a few lintels, cills and quoins for a local builder or a major supply contract for a city centre development or a restoration project, all customers are valued equally and every effort is made to make your buying experience a pleasurable one. Exceeding expectations is the McMonagle’s objective. The company’s production capability includes primary, secondary and profiling saws, lathes and masonry facilities. It has a huge range of natural stone and paving products to suit every pocket. The demand for quality stone from designers, architects and home builders which the company has supported over the years has been expanded in recent times to offer the widest range of natural stone products sourced from Ireland and around the world. As the largest importer of natural stone from India, China, Brazil, Egypt, Vietnam, Poland, Germany, Portugal and Italy, McMonagle provides an unrivalled choice and assurance of quality on an impressive range of sandstone, limestone, granite, marble and porphyry paving and paving accessories. Many new and refurbished buildings in Ireland, the UK, Europe, Japan and the USA display McMonagle Stone products, with its unique and durable features as well as a sense of warmth and individuality. The inherent decorative qualities of McMonagle Stone in whatever form or design gives an enhancing appearance when combined with old or modern materials. Visitors to the company’s stone library and displays at Mountcharles can choose from over 200 different types of stone. Friendly and professional staff are on hand to help you choose the product to suit your needs and budget requirements. McMonagle Stone has access to an extensive range of stone. 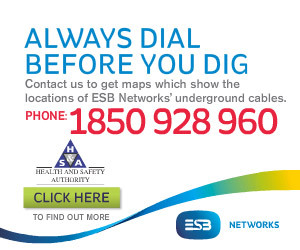 These may be from one of its quarries in Ireland or from its partners in Asia or Portugal, Poland and Germany. The company was proud to supply Mountcharles Sandstone for Jane McCorkwell’s award winning design at Bloom 2015. Winning Gold and Best in Show, the concept for the design was ‘Our Origin is Green’. While using Mountcharles Sandstone throughout the design, Jane also used Silver Quartzite. “If there was an upside to the recession, it was it made us focus more on the export side of our business. We are now exporting to nine different countries, with Japan and Austria being our two biggest markets. About 40 per cent of our products are now exported,” Daniel concludes. Head Office & Display Area, Mountcharles, Co. Donegal. Opening hours: Monday-Friday 8am-6pm; Saturday: 8am-1pm.